None of the local residents needs them, these half tourist preying, half alcoholism serving over expensive stores. But we have yet another one. Next to the Tune hotel on Grays Inn Rd. 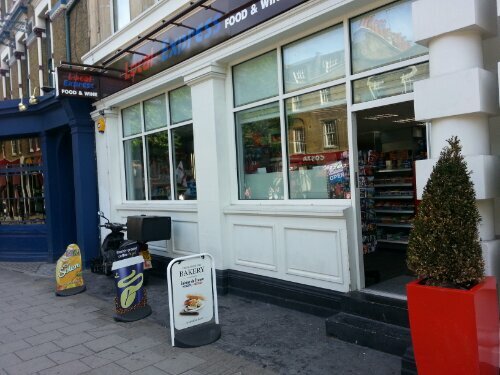 emerged yet another off licence convenience shop the seventh or tenth within 500 square meters depending how you count. Who is welcoming it? This entry was posted in Food and Drink, Local businesses. Bookmark the permalink. except it is not Tesco! If it’s any comfort, this would be very unlikely to happen on the Islington side of the border. We have adopted new licensing policies which declare all the Clerkenwell and KX area to be a zone of “cumulative impact” … in plain language it means we have reached saturation point and no additional alcohol licenses will be granted unless there is an exceptional justification. Islington is also undertaking tough enforcement action, e.g. a programme of license reviews especially where retailers fail on “test-purchases” by under-18s (usually by Police Cadets) or where anti-social behaviour is regularly reported or when our trading standards inspectors find smuggled or fake goods. We are revoking licenses in these circumstances. Islington is also planning to introduce a Late Night Levy early in 2014 where all premises licensed to sell alcohol after midnight will have to pay into a fund dedicated to covering the extra policing and clean-up costs associated with the “night-time economy”.